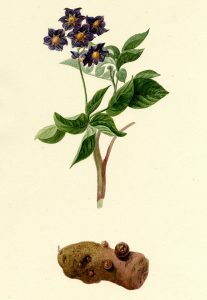 The vitelotte (Solanum tuberosum var. Vitelotte) is an exotic crop that is slowly starting to make its way into the common folk’s agriculture. 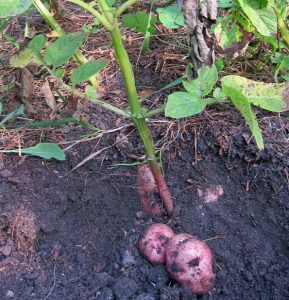 Alongside the sweet potatoes, the vitelottes are a niche crop that can bring farmers huge profits. The vitelottes contain huge quantities of anthocyanin pigments that keep the heart healthy. The vitelottes are also recommended to obese people as it is healthier than the regular white or red potatoes. The vitelotte originated from South America and it has been drought to Europe by the well-known explorers. The vitelotte is a perennial plant in the areas it originated from. It grows a fibrous, branched and highly absorbent root. The vitelotte has underground stems (stolons and tubercles). The stolons are ramifications of the underground stems, that are thickened and juicy. The tubercles are plant organs where large quantities of reserve substances accumulate. The leaves are compound and odd-pinnate, with differently-sized leaflets, placed on both sides. The flowers are grouped in cymes, have various colors (white, violet, blue, pink-violet, yellow). The fruit is a spherical berry. The roots will start to grow at a 6-7 degrees Celsius temperature, the optimum level for the plant and tubercles growth ranges between 7 to 27 degrees Celsius, depending on the development phase. Temperatures exceeding 40 degrees Celsius will negatively affect the production. Light insufficiency will affect the growth of all the plant’s parts, negatively influencing the tubercles production. The soil humidity must be kept at 70-80%. Insufficient humidity can lead to a stagnation in the tubercle growth, but excess humidity can lead to diseases. The vitelotte prefers light soils, with a pH ranging from 5-6. The vitelotte must not be planted after other species from the solanacee species. We recommend a 4 years crop rotation, but a 2 or 3-year crop rotation is recommended if no nematode attack has been observed. The best predecessor crops for the vitelotte are: plants from the Gramineae species, grain cereals, clover, alfalfa, annual legumes, corn, plants from the Brassica oleracea species, flax, sunflower, root vegetables, or bulb plants. It is not recommended to use the sugar beet as a predecessor crop. For the vitelotte the monocrop is not recommended. 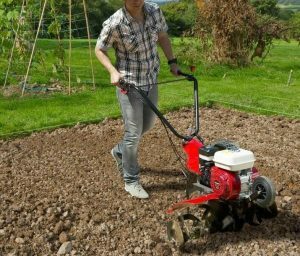 Once the soil has been cleaned from the previous crop, plow it using the disk cultivator as this will destroy the weeds and vegetal residues. The plow needs to be performed right away, at a 28-30-cm depth. If the soil is heavy and compact, it can be scarified. Pressing the soil will significantly reduce the vitelotte production. After plowing or scarifying, the soil must be levelled. This will have a positive influence on the future procedures that need to be carried out (planting, applying herbicides, etc). Preparing the soil for planting needs to be done at a 14-18-cm depth, using the cultivator. In the parcel, the soil can be arranged in heightened layers as this will aid in warming the soil, it will avoid pressing the soil, it will ease the access in the crop and it reduces the probability of hurting the plants while performing the needed maintenance procedures on the crop. This needs to be done in many phases. The first heightened soil layer needs to be 10-12-cm high and it must be built when planting. Once the plants have been successfully integrated into the soil, build a 30-cm high soil layer. The following procedures need to be intended to maintain the already created soil layers or to restore the soil layers that have been affected after the maintenance procedures have been carried out. We recommend using a healthy planting material, with no trace of diseases and pests. You can also used species that are resilient to diseases and pests. Examples of products to be used for treating the vitelotte tubercles: Prestige 290 FS. To increase the production volume and to reduce the vegetation period, the tubercles can be forced to sprout. The minimum temperature for planting is 7 degrees Celsius. Looking at the calendar, the proper planting period can be marked at the end of March. This can be done mechanically or chemically. The main herbicides that need to be used for the vitelotte crop are: Agil 100 EC, Fusilade Forte, Pantera 40 EC, Titus 25 DF, Dual Gold, Sencor 70 WG, Stomp Aqua, Surdone 70 WGD. To read information about the diseases and pests that can affect the vitelotte crop, please search for and read the dedicated article. The soil humidity must be kept at around 70-80% during the entire vegetation period. To assure this humidity percentage, the vitelotte crop must be irrigated between 3 to 12 times, depending on the soil and climate conditions. 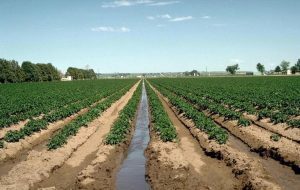 The crop must be watered using 300-500 cubic meters per hectare. Drip irrigation can be used for the vitellote crop. 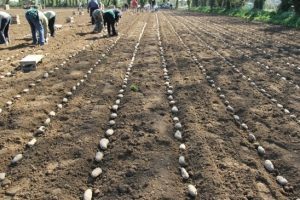 This is the most economic irrigation method, easy to use and it won’t affect the plants, keeping the soil accessible. For large productions, the vitelotte will consume large quantities of nutritious elements. The nitrogen is decisive for the tubercles production, contributing to the growth of the plant’s leaf mass and to the growth of a well-developed root system. The phosphorus increases the tubercles resilience towards mechanic wounds and storage. 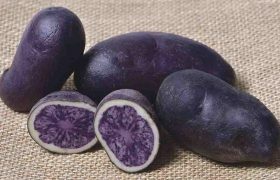 The potassium increases the tubercles’ starch content and the storing life spawn. The organic compost can be applied using 20-30 tons per hectare. The best results can be achieved by fertilizing the vitelotte crop using a mineral-organic fertilizer. A complex NPK fertilizer can be applied before sowing, using Complex NPK 6-8-15 + Mg or 6-15-3 + Mg. During the vegetation period, apply leaf fertilizers along with the treatments against diseases and pests. The leaf fertilizers can be applied in 3 phases, once every 10-12 days. Products to be used: Atonik, Cropmax, Terra-Sorb, Blackjak, Amalgerol. The vitelotte needs to be harvested once the tubercles have reached the desired size, or when the stalks have become dry. 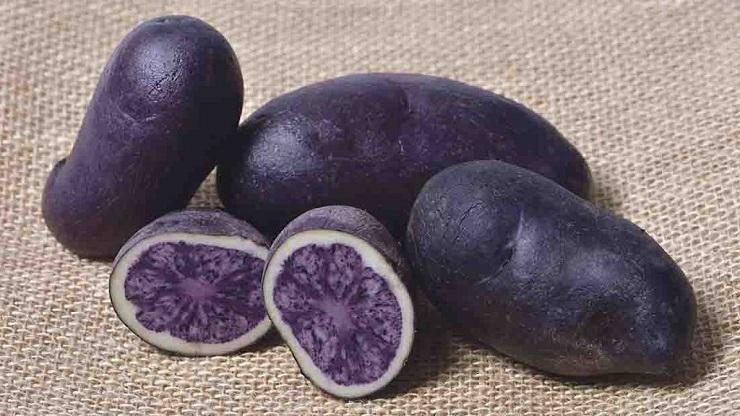 The harvesting process needs to be carefully performed, not to harm the tubercles when extracting them from the soil. These need to have the soil removed from them and placed in a sunny spot for a while. It can be then stored inside cool and dark storage rooms.